Takeaway: Saffron, the world's highest-priced spice, lends a distinctive and highly prized flavor to many dishes. It turns out the crocus sativus plant can thrive in a hydroponic system. Saffron can indeed thrive without soil. A controlled environment is preferred so delicate stigmas (the part we harvest and eat) will be protected. Being of Iranian background, I use saffron in practically every dish; let’s just say my family is addicted to the stuff. So the thought of growing my own saffron, a spice that costs more by weight than gold, exhilarated me! I was inspired to embark on this journey after reading Strands of Gold: Growing Saffron, written by Dr. Lynette Morgan and published in a prior edition of Maximum Yield USA. The article explained there is no one way to grow saffron indoors and that I would need to experiment to find out what method would be best for me. I’m an avid hydroponic gardener, so I was happy to learn saffron can indeed thrive without soil. A controlled environment is preferred so delicate stigmas (the part we harvest and eat) will be protected. I also learned you plant the bulbs and harvest the stigmas in the fall, which is when the crocus sativus plant flowers. After you’ve harvested the stigmas, you let the corms (the bulbs) overwinter outside, then dig them up before the next summer. I began by purchasing some corms from a local garden center as well as a Kashmiri type from Odyssey Bulbs. I grew them on my flood tables in my 14x20 foot greenhouse with natural light. I first planted the corms in 1.5 inch starter plugs, following all the directions on how to properly condition rockwool. Once they were rooted, I transplanted them into three-inch rockwool blocks. For nutrients, I initially chose to use root building and micronutrient-providing mixtures at an electrical conductivity (EC) of 1.0, then switching the root-building nutrient to one that stimulates flower development at an EC of about 1.5 as soon as the flower buds began to appear. I top watered with fresh solution each time, allowing the blocks to get close to 50 per cent dry before watering again. 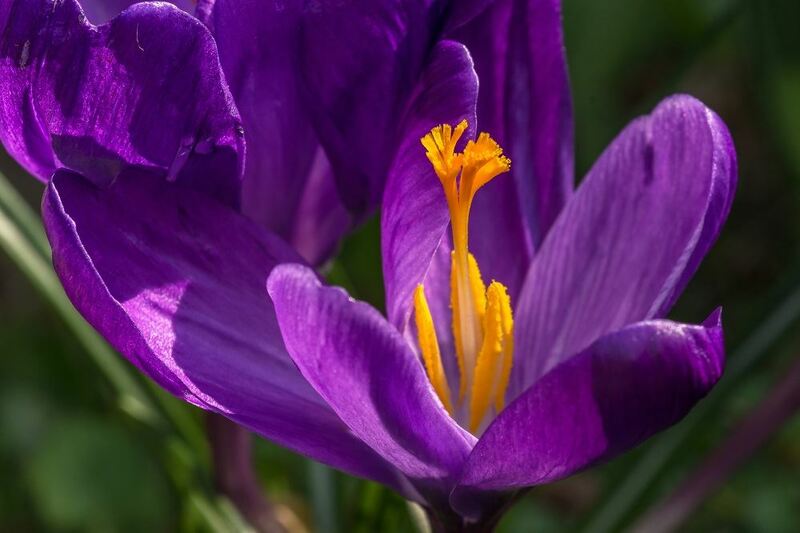 "Bulbs, including crocus bulbs, prefer heavy phosphorous and potassium for good growth." The plants did well, but I realized I didn’t need much rockwool because the corms didn’t root into the block much. After harvest, I transplanted the corms outside in my plant bed so they could overwinter. I added some bulb starter to the soil before planting. I actually removed the starter plugs from the blocks, and then transplanted the corms in the plugs outdoors. Here in North Carolina, the crocus grew well throughout the winter—it’s a pretty hardy plant and should withstand the cold even in northern climates. At the end of May, I dug up the corms and dried them on a drying rack, then stored the corms in a box and kept them in a well-ventilated area for my next year's cultivation. The next year, I decided to grow my saffron a little differently. Since I discovered the three-inch rockwool blocks were overkill, I am now growing them directly in two-inch mini-blocks. I also decided to experiment with different nutrients this time. I had good results with the former series, but I wanted to see what another type would do for a crocus bulb that produces an aromatic spice. Bulbs, including crocus bulbs, prefer heavy phosphorous and potassium for good growth. I ensured my nutrients would provide lots of phosphorous and potassium, and just the right amount of nitrogen. I am hoping the change in nutrients will induce more production of safranal—the organic compound responsible for the aroma of saffron. I started by soaking the two-inch blocks in pH 5.5 water. I used the excess water on some plants outside, and then soaked the blocks in a 1.0 EC nutrient solution. I then lined the blocks up on my flood table and began top watering with fresh solution every time, a method I prefer over ebb and flow for growing saffron. As this was my second crop, I sorted through the corms I had been storing, and chose only the ones an inch or more in size. Anything smaller might not flower. I’ll plant the smaller corms outside in my plant bed to allow them to grow bigger for my next cultivation. I pressed each of the larger corms into one of the two-inch blocks and continued to water with nutrients formulated to stimulate roots and the vegetative state of flowering plants, gradually increasing the EC. As the leaves broke open on the corms, I switched to nutrients designed to pack on extra size and weight and encourage flowering at an EC of 1.4. In my North Carolina climate, my greenhouse stays warm enough in the fall during the day so plants flower before winter sets in. Those growing saffron further north may need a heated greenhouse or an indoor operation under grow lights. Another idea would be to use heat mats placed under the saffron and perhaps a clear plastic propagation dome over the flood table to keep the plants warm. Just make sure it doesn’t get too hot under the dome—you want to keep good air circulation and temperatures in the 60°F range. As I write this, I’m just about to start harvesting the stigmas. Then I’ll start the cycle all over again by transplanting the corms in their blocks into my outdoor plant bed for the winter. I’ll harvest the stigmas using tweezers, and then I place them on a paper towel and dry them in the microwave for 20 seconds at a time for up to a minute. That does the job, or you can dry them in a dehydrator. Then I store in a cool and dark place with a packet of desiccant to keep the stigmas dry. Just before summer, I harvest the corms and store them in a cool, dry place until it’s time to plant them again next fall. The only drawback is that I may run out of room for all the corms, since they duplicate over the winter. Not a bad problem to have! So there you have it, growing saffron hydroponically is a viable way to ensure a steady supply of this spice for your culinary needs.